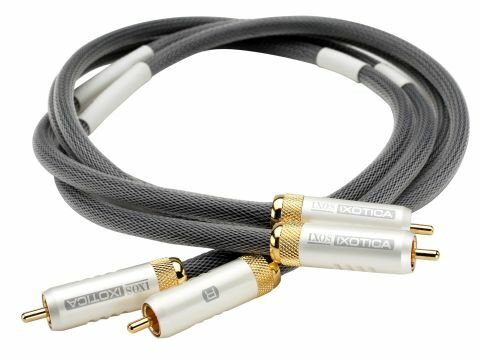 This may be an easy listening cable, but it's still detailed enough to make analytical listening very rewarding. Ixos has been around as a cable brand for a few years now and its trademark Gamma Geometry has become a familiar sight. The essence of Gamma is that the two signal-conducting cores of the cable (be it interconnect or speaker cable) are twisted with a third, non-conducting, core in such a way that the conductors cross at right angles. These are held further apart than usual in a basic twisted-pair geometry, where of course they are basically in contact along their length. While we can't entirely endorse all the technical claims made by Ixos for this arrangement, it's clear that it is a cunning way of reducing capacitance without significantly worsening the excellent interference rejection of twisted pair cable. In this particular embodiment, the cheapest of the relatively new and upmarket Ixotica range, the stranded conductors are individually insulated with a coating Ixos calls Aptimus. This prevents any imperfect conduction between strands. We found the sound of this cable neutral and clean, with a rather unusual quality to the bass. This seems full, but just a touch more present than we're used to. It's not blowsy or out of control, but tonally a little forward and as a result the overall sound of the cable is very appealing, particularly so at low listening levels.